Every act that denies or limits the freedom of the individual in this country costs us the ... confidence of men and women who aspire to that freedom and independence of which we speak and for which our ancestors fought. Edward Roscoe Murrow (born Egbert Roscoe Murrow; 25 April 1908 – 27 April 1965) was an American journalist. He first came to prominence with a series of radio news broadcasts during World War II, which were followed by millions of listeners in the United States and Canada. Many journalists consider Murrow one of journalism's greatest figures, noting his honesty and integrity in delivering the news. 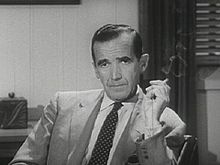 A pioneer of television news broadcasting, Murrow produced a series of TV news reports that helped lead to the censure of Senator Joseph McCarthy. Everyone is a prisoner of his own experiences. No one can eliminate prejudices — just recognize them. The newest computer can merely compound...the oldest problem in the relations between human beings, and in the end the communicator will be confronted with the old problem, of what to say & how to say it. Sign off line of his radio and TV broadcasts. This program is not a place where personal opinion should be mixed up with ascertainable facts...It is not, I think, humanly possible for any reporter to be completely objective, for we are all to some degree prisoners of our education, travel, reading—the sum total of our experience. It seems to me that any action that arbitrarily limits the citizen's access to sight, sound and print, upon which opinion can be based, is, in the true sense of the phrase, un-American. Is it not possible that an unruly head of hair, an infectious smile, eyes that seem remarkable for the depths of their sincerity, a cultivated air of authority, may attract huge television audiences regardless of the violence that may be done to truth or objectivity? 1959, Dons Or Crooners? : Three Lectures on the Subject of Communication in the Modern World, The British Association Granada Lectures, (Three lectures given in Guildhall London in October 1959 on the subject of communication in the modern world), Lecture Title: Television and Politics, Speaker: Edward R. Murrow, Start Page 47, Quote Page 75 and 76, Published by Granada TV, London. The politician in my country seeks votes, affection and respect, in that order...With few notable exceptions, they are simply men who want to be loved. The politician is...trained in the art of inexactitude. His words tend to be blunt or rounded, because if they have a cutting edge they may later return to wound him. Comments after President John F. Kennedy's inaugural address (20 January 1961). I have reported what I saw and heard, but only part of it. For most of it I have no words. If I've offended you by this rather mild account of Buchenwald, I'm not in the least sorry. Full transcript and audio recording at This I Believe. This I Believe — by that name, we present the personal philosophies of thoughtful men and women in all walks of life. In this brief space, a banker or a butcher, a painter or a social worker, people of all kinds who need have nothing more in common than integrity, a real honesty, will write about the rules they live by, the things they have found to be the basic values in their lives. We hardly need to be reminded that we are living in an age of confusion — a lot of us have traded in our beliefs for bitterness and cynicism or for a heavy package of despair, or even a quivering portion of hysteria. Opinions can be picked up cheap in the market place while such commodities as courage and fortitude and faith are in alarmingly short supply. There is a mental fear, which provokes others of us to see the images of witches in a neighbor’s yard and stampedes us to burn down this house. And there is a creeping fear of doubt, doubt of what we have been taught, of the validity of so many things we had long since taken for granted to be durable and unchanging. It has become more difficult than ever to distinguish black from white, good from evil, right from wrong. Except for those who think in terms of pious platitudes or dogma or narrow prejudice (and those thoughts we aren’t interested in), people don’t speak their beliefs easily, or publicly. This reporter’s beliefs are in a state of flux. It would be easier to enumerate the items I do not believe in, than the other way around. And yet in talking to people, in listening to them, I have come to realize that I don’t have a monopoly on the world’s problems. Others have their share, often far bigger than mine. This has helped me to see my own in truer perspective: and in learning how others have faced their problems — this has given me fresh ideas about how to tackle mine. If none of us ever read a book that was "dangerous," had a friend who was "different," or joined an organization that advocated "change," we would all be just the kind of people Joe McCarthy wants. The only thing that counts is the right to know, to speak, to think — that, and the sanctity of the courts. Otherwise it's not America. We can deny our heritage and our history, but we cannot escape responsibility for the result...We proclaim ourselves, as indeed we are, the defenders of freedom, wherever it continues to exist in the world, but we cannot defend freedom abroad by deserting it at home. No one familiar with the history of this country can deny that congressional committees are useful. It is necessary to investigate before legislating, but the line between investigating and persecuting is a very fine one and the junior Senator from Wisconsin has stepped over it repeatedly. His primary achievement has been in confusing the public mind as between the internal and the external threats of communism. We must not confuse dissent with disloyalty. We must remember always that accusation is not proof and that conviction depends upon evidence and due process of law. We will not walk in fear, one of another. We will not be driven by fear into an age of unreason, if we dig deep in our history and our doctrine, and remember that we are not descended from fearful men — not from men who feared to write, to speak, to associate and to defend causes that were, for the moment, unpopular. This is no time for men who oppose Senator McCarthy's methods to keep silent, or for those who approve. We can deny our heritage and our history, but we cannot escape responsibility for the result. There is no way for a citizen of a republic to abdicate his responsibilities. As a nation we have come into our full inheritance at a tender age. We proclaim ourselves, as indeed we are, the defenders of freedom, wherever it continues to exist in the world, but we cannot defend freedom abroad by deserting it at home. The actions of the junior Senator from Wisconsin have caused alarm and dismay amongst our allies abroad, and given considerable comfort to our enemies. And whose fault is that? Not really his. He didn't create this situation of fear; he merely exploited it — and rather successfully. Cassius was right. "The fault, dear Brutus, is not in our stars, but in ourselves." Good night, and good luck. The reference to Cassius is that of the character in William Shakespeare's play Julius Caesar. Listen to an mp3 sound file of parts of this statement. Speech to the Radio and Television News Directors Association (RTNDA) convention in Chicago (15 October 1958). Full audio recording. I have no technical advice or counsel to offer those of you who labor in this vineyard, the one that produces words and pictures. You will, I am sure, forgive me for not telling you that instruments with which you work are miraculous, that your responsibility is unprecedented or that your aspirations are frequently frustrated. It is not necessary to remind you of the fact that your voice, amplified to the degree where it reaches from one end of the country to the other, does not confer upon you greater wisdom than when your voice reached only from one end of the bar to the other. All of these things you know. A variant of part of this statement is often quoted: Just because your voice reaches halfway around the world doesn't mean you are wiser than when it reached only to the end of the bar. Our history will be what we make it. And if there are any historians about fifty or a hundred years from now, and there should be preserved the kinescopes for one week of all three networks, they will there find recorded in black and white, or perhaps color, evidence of decadence, escapism and insulation from the realities of the world in which we live. During the daily peak viewing periods, television in the main insulates us from the realities of the world in which we live. If this state of affairs continues, we may alter an advertising slogan to read: LOOK NOW AND PAY LATER. I have reason to know, as do many of you, that when the evidence on a controversial subject is fairly and calmly presented, the public recognizes it for what it is--an effort to illuminate rather than to agitate. If radio news is to be regarded as a commodity, only acceptable when saleable, and only when packaged to fit the advertising appropriation of a sponsor, then I don't care what you call it — I say it isn't news. Stonewall Jackson, who knew something about the use of weapons, is reported to have said, "When war comes, you must draw the sword and throw away the scabbard." The trouble with television is that it is rusting in the scabbard during a battle for survival. We used to own our slaves; now we just rent them. Jack Gould, TV critic for The New York Times after Murrow's See It Now broadcast of 9 March 1954. Ed Murrow told his generation of journalists bias is okay as long as you don't try to hide it. So here, one more time, is mine: plutocracy and democracy don't mix. It was astonishing how often his name and work came up. To somebody outside CBS it is probably hard to believe...Time and again I heard someone say, "Ed wouldn't have done it that way." Inscription on a plaque dedicated to Murrow in the lobby of CBS headquarters in New York City. CBS Chairman William Paley, in his eulogy of Murrow.